Ma Xiaoguang, spokesperson with the State Council Taiwan Affairs Office, made the comment at a news conference in response to the American Institute in Taiwan recently acknowledging military staff has been posted at its Taiwan office since 2005, as well as that US weapons manufacturer Raytheon granted a $9 million contract to upgrade Taiwan's Patriot missile defense system. 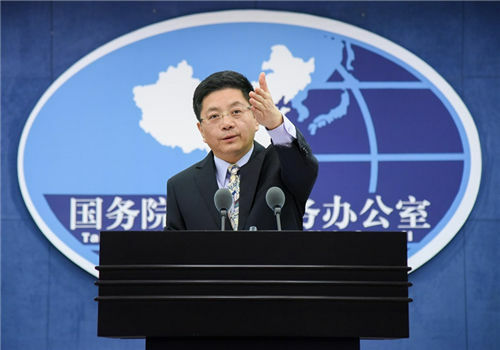 "We resolutely oppose any official interaction or military dialogue between the US and the Taiwan region," Ma said, adding the US side should "keep its promise and correct its mistakes." "The US should handle the Taiwan question carefully and properly, so as not to damage Sino-US ties as well as the peace and security in the Taiwan Straits," Ma said. On March 31, two Chinese People's Liberation Army Air Force Shenyang J-11 fighter jets flew across the so-called median line of the Taiwan Straits, prompting a strong reaction by Taiwan leader Tsai Ing-wen. She responded by vowing a "forceful expulsion" of Chinese fighters should they cross the line again. Ma said the fly-by is part of the PLA's planned routine exercise this year. "There is only one China in the world, and both the mainland and Taiwan belong to the same China," he said. "Protecting national sovereignty and territorial integrity has been the sacred duty of the PLA, and it is in the interest of people from both sides of the straits." "Opposing Taiwan secession is also the joint responsibility for people from both sides," Ma said. "Tsai's wild talk means she is scared. We warn them not to play with fire. Don't even think about it."